Thousands are expected to enjoy a evening of music at the BBC Proms in the Park event at Titanic Slipways, Belfast tonight. BBC Proms in the Park in Northern Ireland is in its 17th year and all tickets have all gone. An audience of around 11,000 is expected. 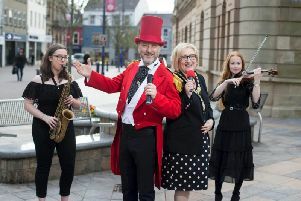 The event will be hosted by BBC Northern Ireland’s Noel Thompson and Claire McCollum and performing will rock musician Midge Ure, classical guitarist Xuefei Yang, and acclaimed mandolin virtuoso Avi Avital with percussionist Ithamar Doari, and the Ulster Youth Choir. One of the world’s biggest names in musical theatre, Kim Criswell, will perform along with Tyrone-born Baritone Karl McGuckin. The line-up is completed by an appearance from 10 members of the cast of Titanic Dance. The concert will be part of broadcast celebrations to mark the Last Night of the Proms, and will link music-making festivities at London’s Royal Albert Hall with BBC events around the UK. Viewers at home will be able to join in the excitement, with the BBC network television services linking with the Titanic Slipways. Highlights programmes will be recorded for later transmission on BBC NI television, BBC Four and the BBC iPlayer. Selected extracts from the Titanic Slipways will also be available on BBC You Tube and the entire concert will also be broadcast live on BBC Radio Ulster/Foyle from 7.30pm.